Some jailbreak tweaks are super useful. They might add a whole host of settings that we wish we had access to by default, but Apple won’t let us, or they might change the way multitasking works in iOS. Then some jailbreak tweaks are, well, not quite as useful. Slide Enhancer probably falls into that second category, although it is no doubt something that someone somewhere has been crying out for at one point or another. 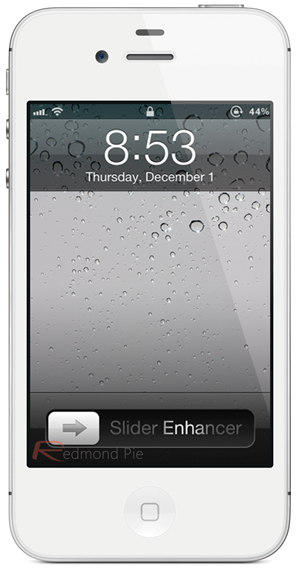 What Slide Enhancer does is actually pretty simple. Once installed for free via the place we always seem to send you for jailbreak apps and tweaks, Cydia, then you will be given a new option in the iOS Settings app. In here you can toggle on and off some different options. What those options actually do, is change the text that is displayed in the ‘Slide to Unlock’ area of your iDevice’s lock screen. Not exactly Earth shattering, but it works. The options are thus: battery percentage, clock, WiFi network name, IP address, a custom label with your own text, and finally the free RAM that your iDevice currently has. When you flick on any one of these switches, that is the information that will be placed in your ‘Slide to Unlock’ bar. If you’re the kind of person that always needs to check how much free RAM you have – perhaps you’re a developer – then switching on that option will give you an easy to access view of what is going on with memory management on your device. That is pretty much it. Slider Enhancer does not add any icons to your homescreen, and is free should you wish to have a play, and can be found under the BigBoss repo in Cydia.